Denise from Pop Culture Cosmetics sent me some of her gorgeous glitters to try, and I thought Revlon Saucy would be a good base for Glitterazzi. I did just one coat of Glitterazzi and loved the effect I got. I topped it with a coat of Gelous followed by a coat of NYC Grand Central Station and it was quite smooth. 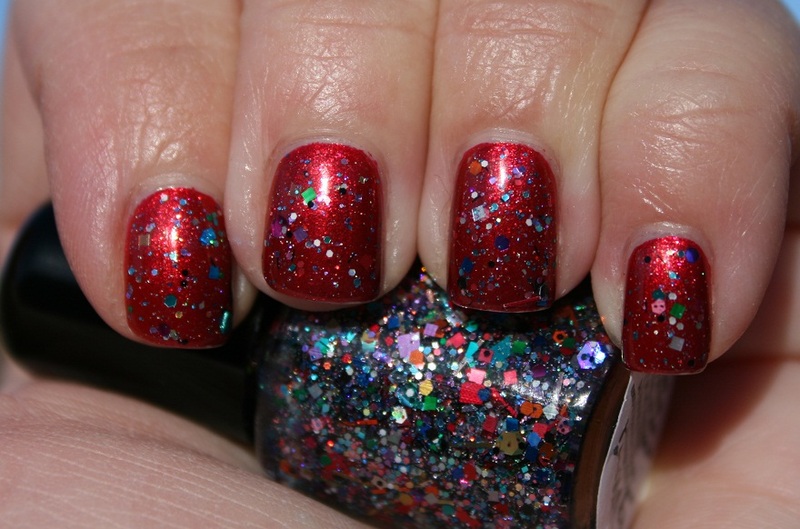 This fabulous polish is a *limited edition* and we've named it Glitterazzi! It's a glitter coat filled with over 65 different glitters of all colors, shapes and sizes, it is really gorgeous!! All of the polishes from Pop Culture Cosmetics are 3-free....they do not contain Toluene, Formaldehyde or Dibutyl Phthalate. Disclosure: Glitterazzi was provided for review purposes. I'm wearing one today, the bottle is at home so I'm not positive which one it is but it is beautiful!